CHERRY HILL – So long, Subaru. Subaru of America, which last year consolidated its South Jersey operations at a Camden headquarters, is preparing to raze its former base in Cherry Hill. 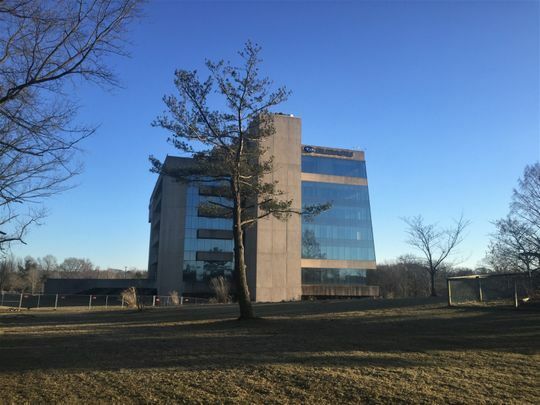 The concrete-and-glass structure, which is between Route 70 and Park Drive on the township’s west side, has been fenced off in anticipation of demolition, a company executive said Tuesday. “With our relocation to Camden, the building is no longer of use to Subaru or to prospective future users of the property,” said Keith Metzger, the firm’s director of corporate real estate and administration. The building will be leveled “with the intention of recycling as much of the building materials as possible,” Metzger said. That approach will reflect “our sustainability ethos of being good stewards of the environment,” the auto company executive added. Demolition at the 14-acre site is to be completed by late spring, Metzger said. Cherry Hill Mayor Chuck Cahn welcomed the company’s announcement. “We are happy to see Subaru’s efforts to make the site as marketable as possible,” he said. “The area surrounding this site has seen a significant surge in revitalization in recent years, as businesses are taking old, antiquated properties and completely reinventing them,” the mayor said. “We look forward to seeing additional future investment into our community,” Cahn said. Subaru, founded in a Philadelphia suburb in 1968, moved its corporate headquarters to South Jersey one year later. Its Cherry Hill headquarters was a seven-story, 115,000-square-feet building on the site of the former Latin Casino nightclub. he company moved some 500 employees to Camden last April, occupyng a 250,000-square-foot building off the Admiral Wilson Boulevard. That site replaced four facilities in Cherry Hill and Pennsauken. The building’s cost was offset by $118 million in state tax breaks, part of $1 billion-plus in incentives awarded to Camden projects by the state Economic Development Authority. For more information about this Cherry Hill office space for lease, or about any other Cherry Hill commercial properties for sale or lease, please contact the team at at Wolf Commercial Real Estate, a Cherry Hill commercial real estate broker that specializes in Cherry Hill commercial real estate listings and services at 856-857-6300. Wolf Commercial Real Estate, a full-service CORFAC International brokerage and advisory firm, is a premier Cherry Hill commercial real estate broker that provides a full range of Cherry Hill commercial real estate listings and services, property management services, and marketing commercial offices, medical properties, industrial properties, land properties, retail buildings and other Cherry Hill commercial properties for buyers, tenants, investors and sellers. Please visit our websites for a full listing of Cherry Hill commercial properties for sale or lease through our Cherry Hill commercial real estate brokerage firm.